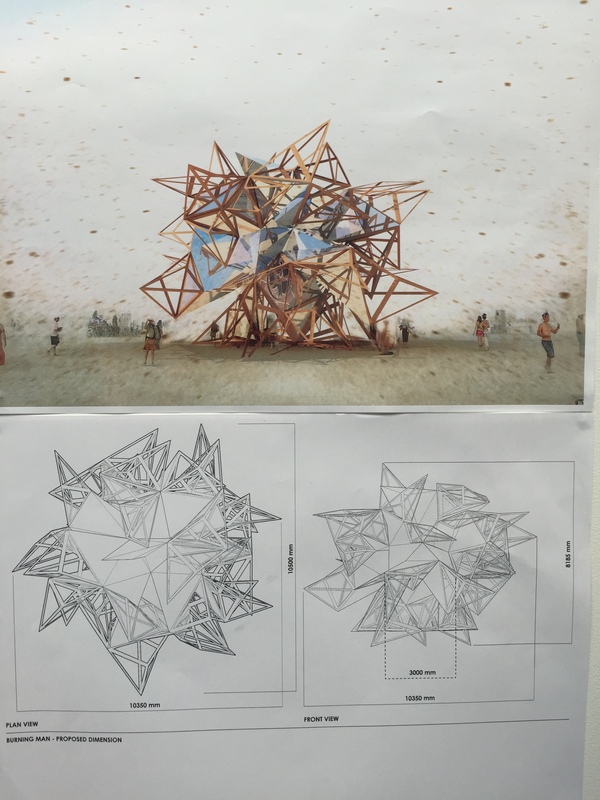 ‘Infinite Territory’ invites burners from the surrounding playa to it’s periphery; its simple mirrored cubic exterior reflects the picturesque landscapes, unpredictable weather and inspirational artworks, creating an experience of both the real and the reflected whilst encouraging unexpected discoveries throughout the journey of the Burning Man Festival. 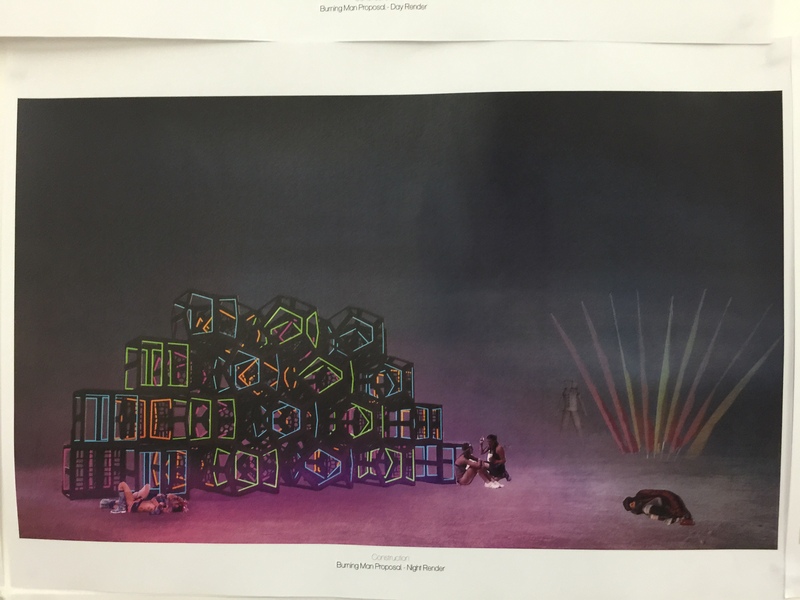 At night, the cube will reflect the vibrancy of the playa. 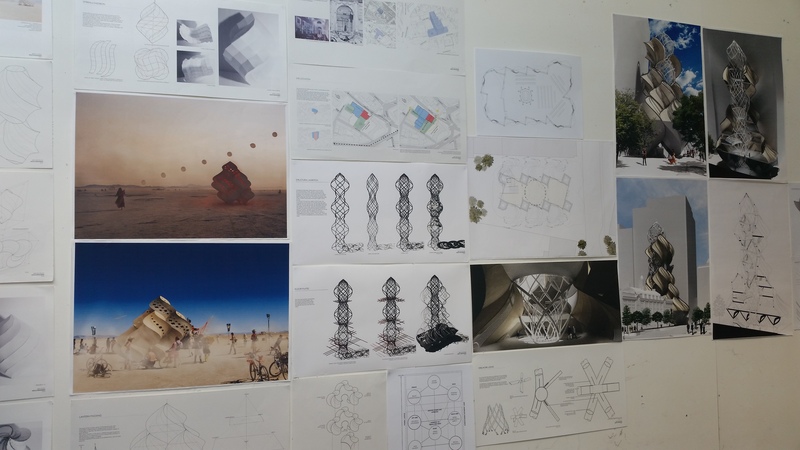 Illuminated strips of colourful light will glow at each edge to allow for clear visibility and frame the vistas; encouraging physical exploration within the structure and providing an immersive experience that juxtaposes the setting of the desert, and in doing so, offers a place for discovery; to recognise our inner selves and the reality of those around us. 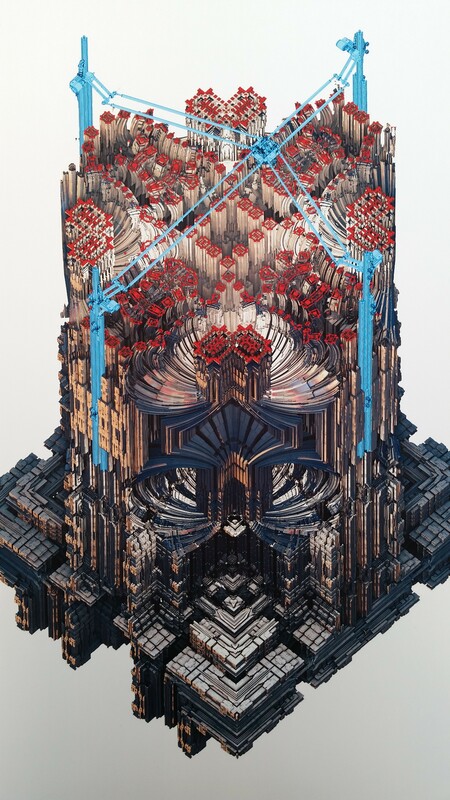 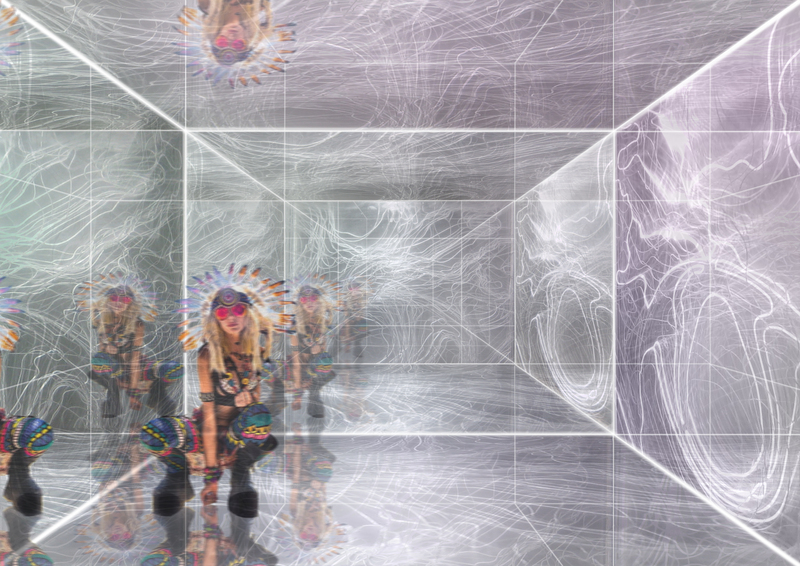 The real gem of the ‘Infinite Territory’ is revealed from within – the burner will climb into a boundless space of infinite reflections that will hypnotise and bewilder, whilst creating a place for contemplation and speculation. 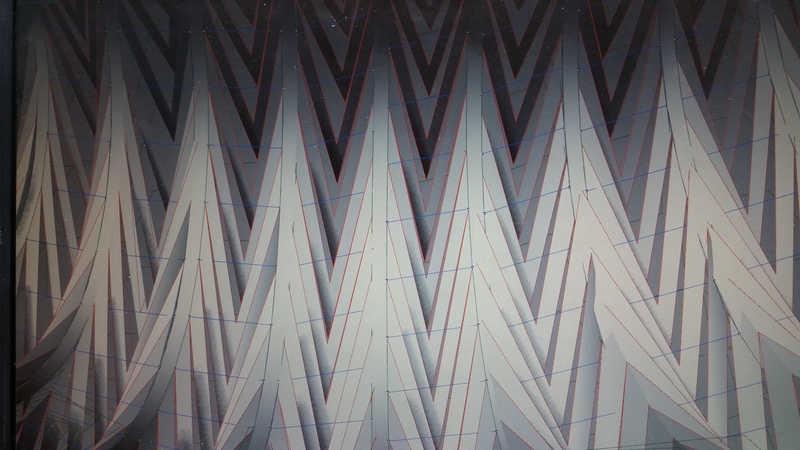 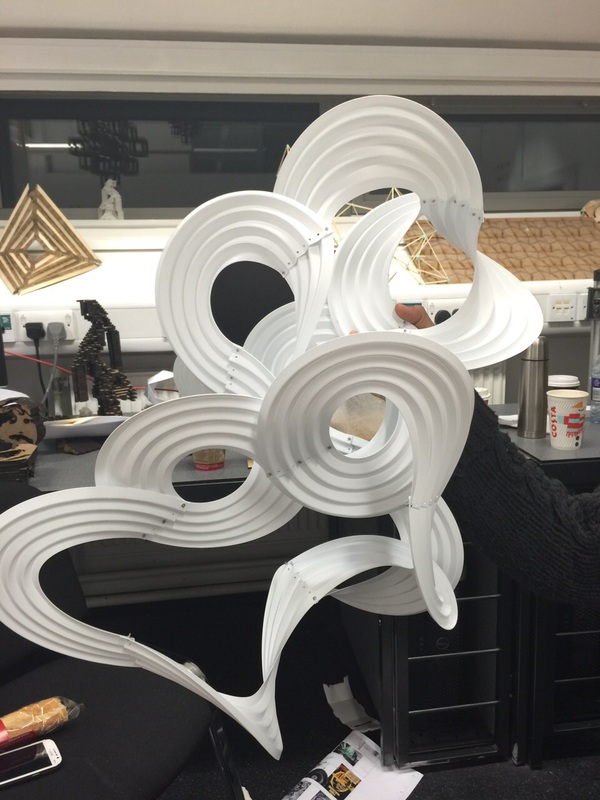 Illuminated patterns will flicker and grow through key-frames of acrylic. 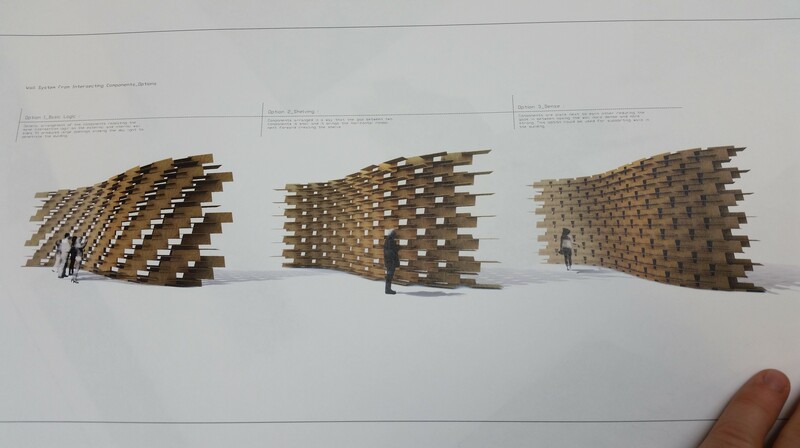 Within this immersive digital dimension will be soft items providing a refuge from the elements. 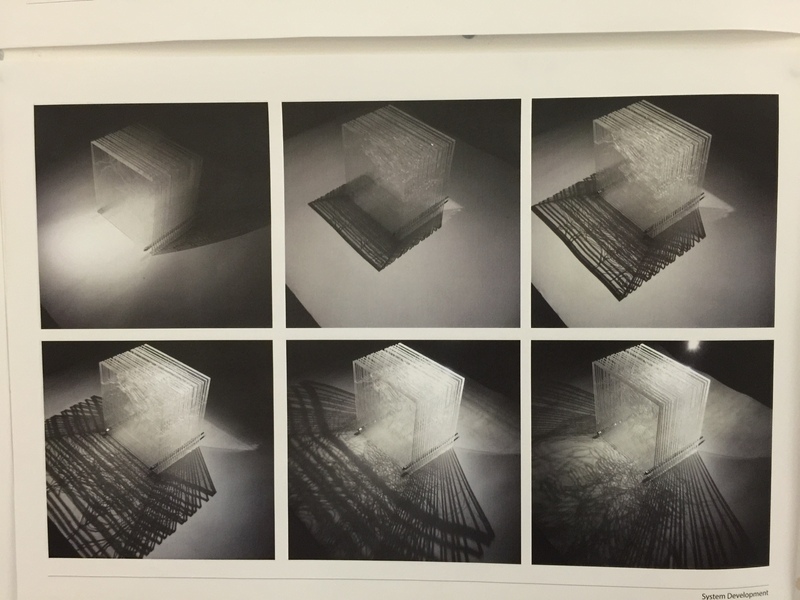 The installation will be made up of mirrored panels at each face of the cube. 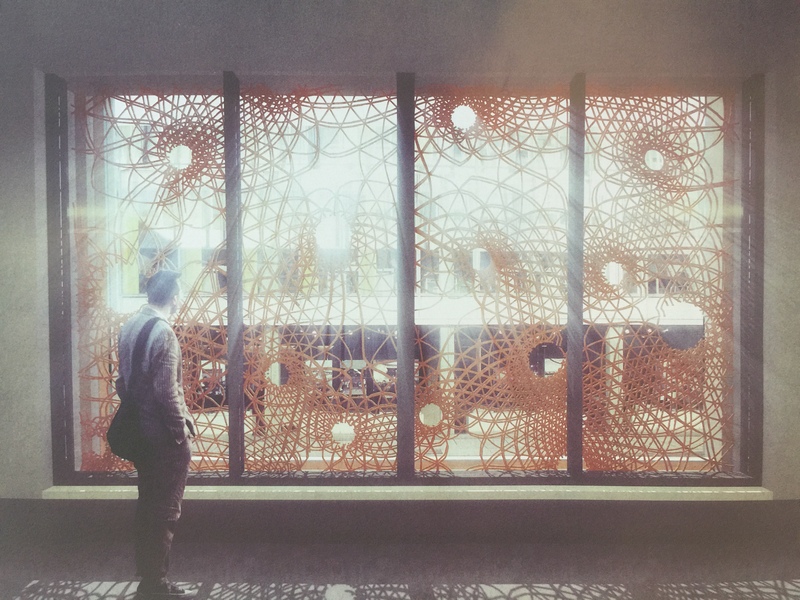 Three of these faces will consist of panels built with five layers of transparent perspex – each panel consists of a different pattern and when light is moved from one to the other it creates a dynamic lighting animation. 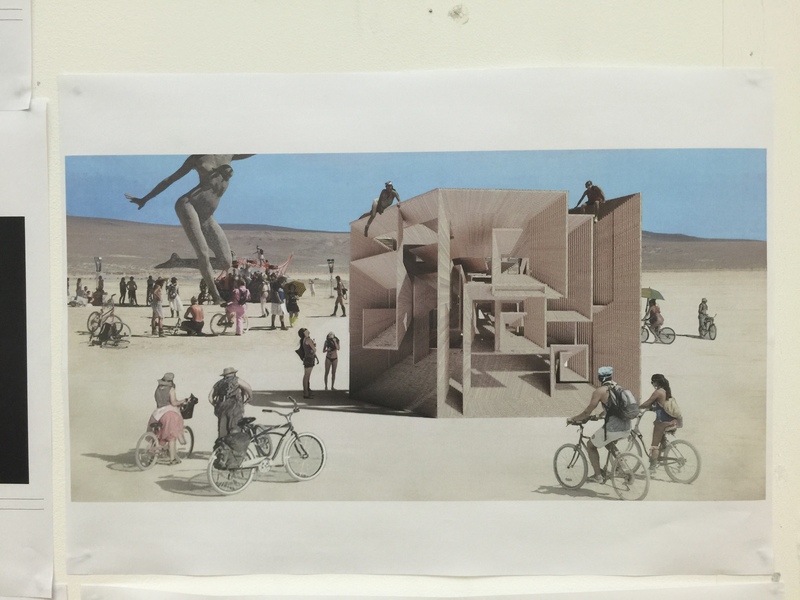 The primary structure of ‘Infinite Territory’ will be a timber framed cube using three meter length beams. 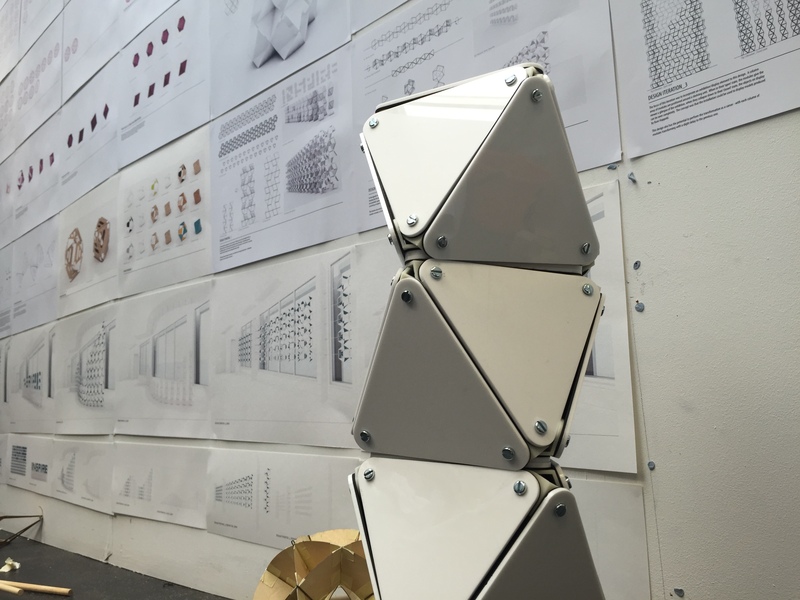 The lateral stability will be reinforced using rigid panels of mirror and acrylic that shall form the artwork for the internal visual of the cube. 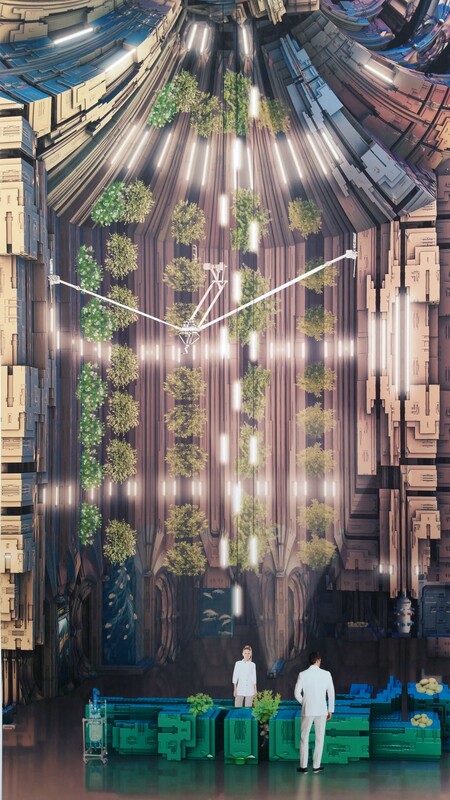 The frame and the perspex/mirrored panels will be joined together (including any internal lighting effects) with metal brackets to reinforce the structure. 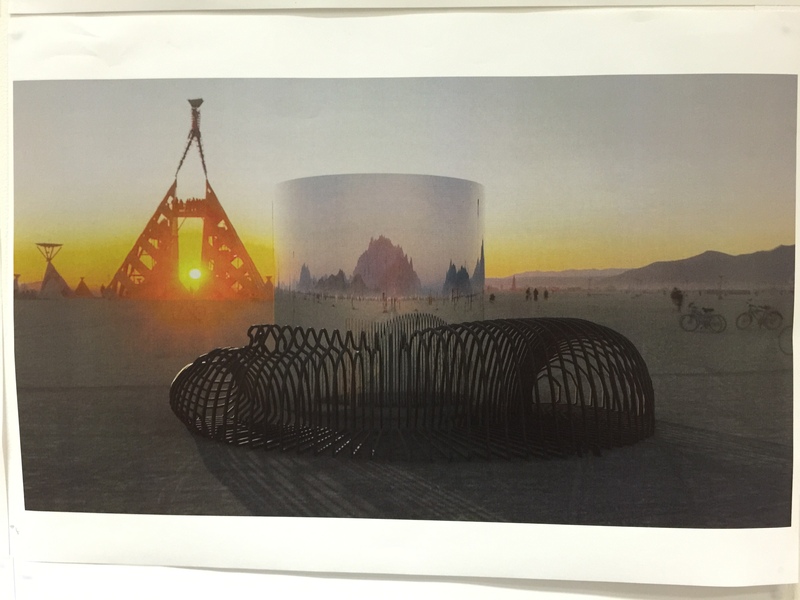 This will help the overall mass resist wind loads and the harsh weather conditions of the Nevada Desert. 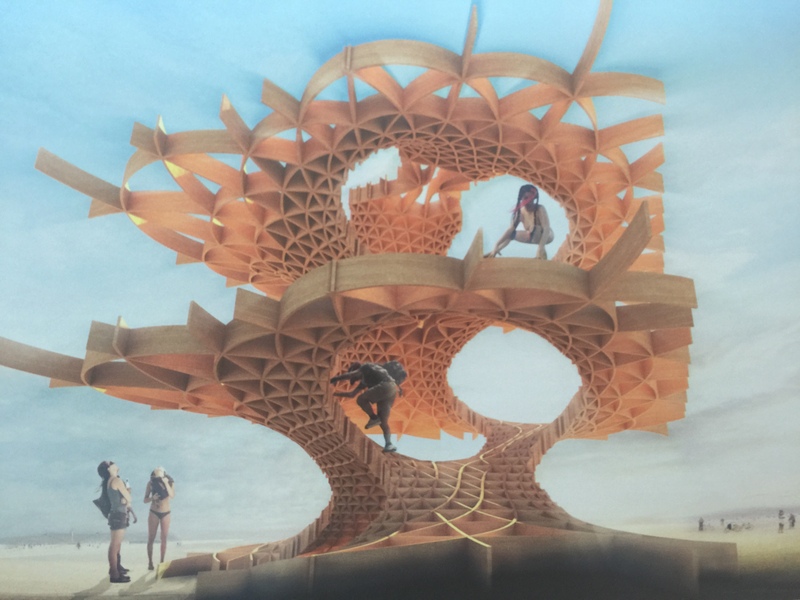 The installation will consist of off-site fabrication of each panel leaving on-site construction reduced to the assembly of it’s component parts. 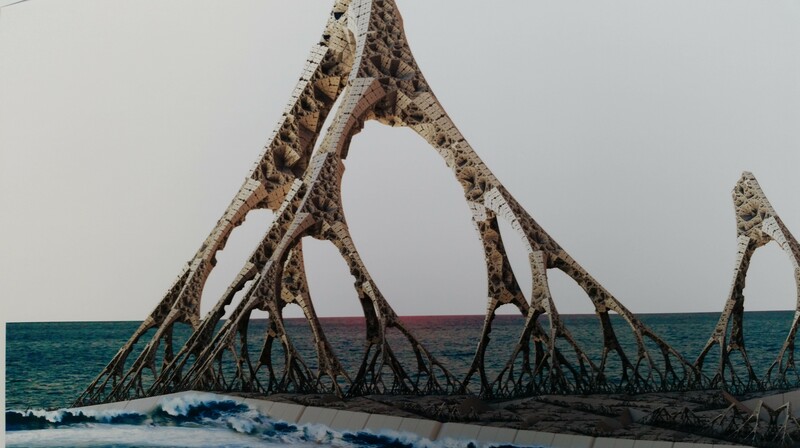 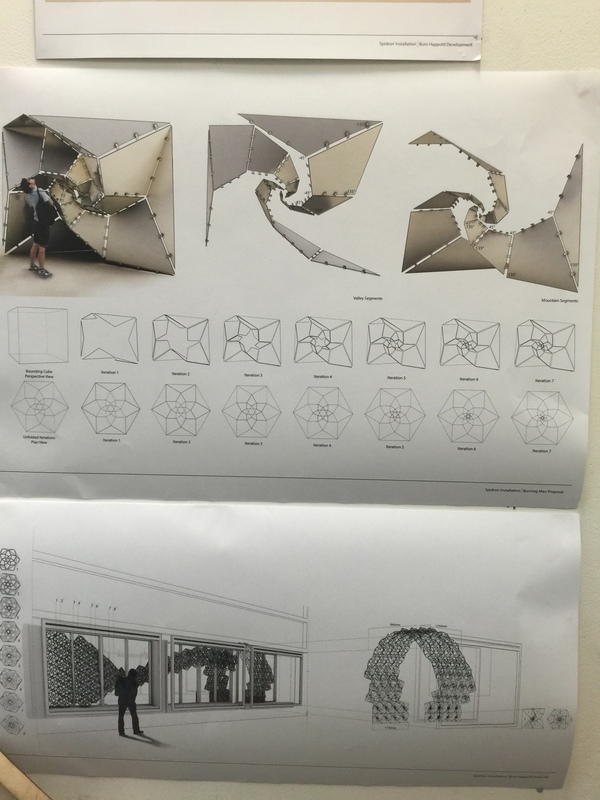 ‘Infinite Territory’ will leave no trace wherever it goes; using a sheet size of 1.5m x 3m, the components of the installation allow for easy construction and deconstruction. 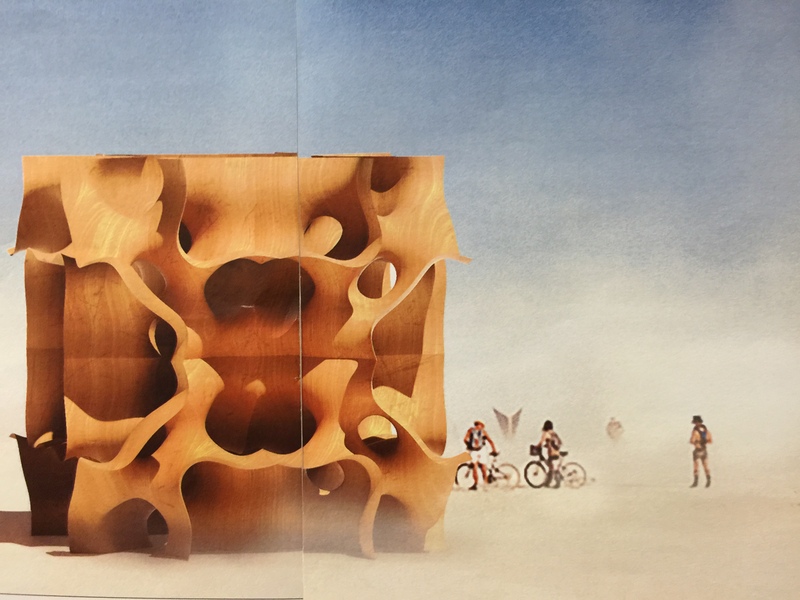 Its weight and self-supporting robust construction means that no foundations are needed and the playa is left untouched beneath its surface. 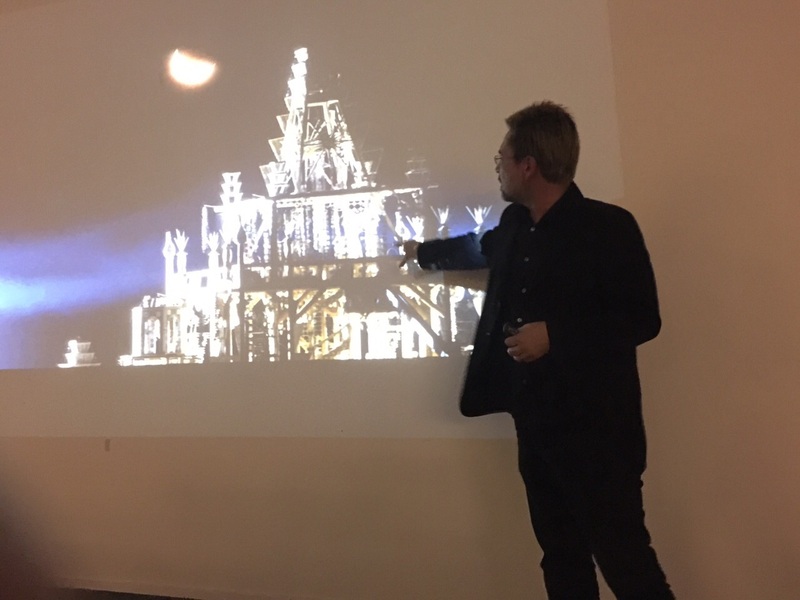 The lighting will feature a pre-sequenced animation of LED strip lights that will illuminate the patterns giving the effect that is shown in the conceptual visuals. 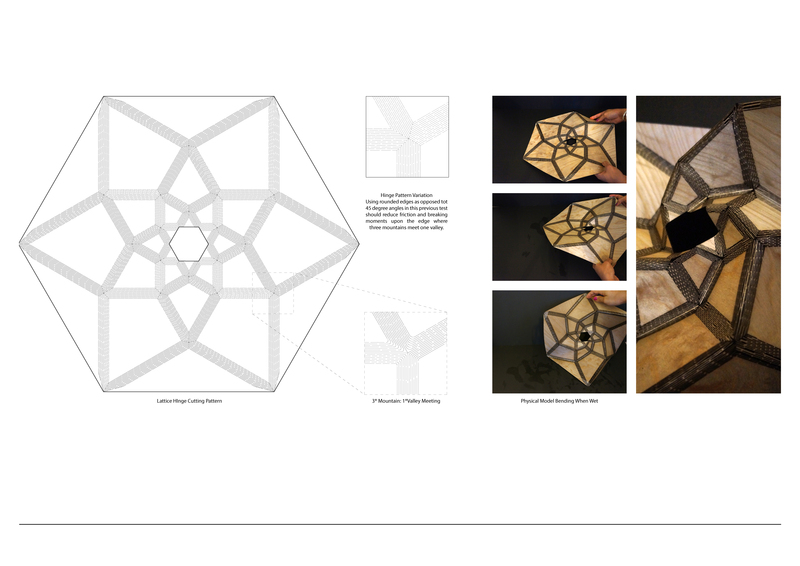 The lighting will be located at two opposite edges of each acrylic panel, and its components will be visually hidden within the structure. 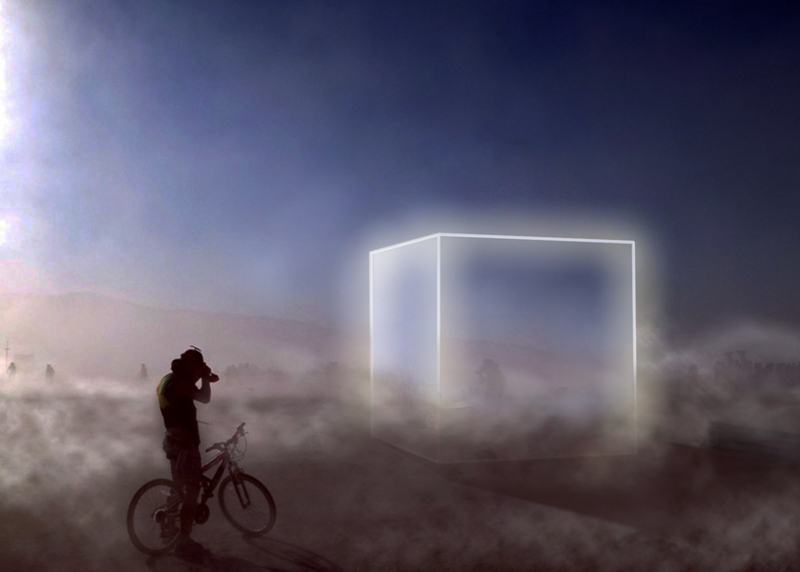 Externally, colourful electroluminescent wire at each edge of the cube will allow for clear visibility of the mirrored surface whilst framing the vistas. 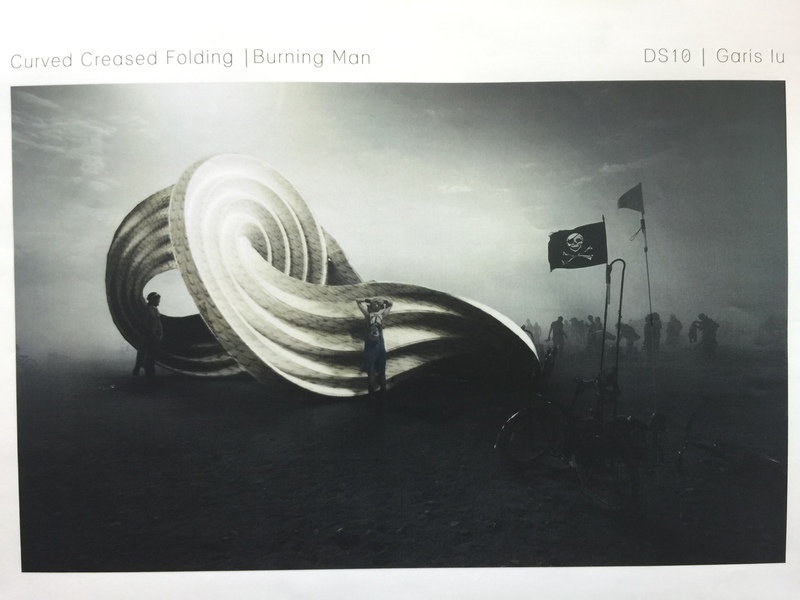 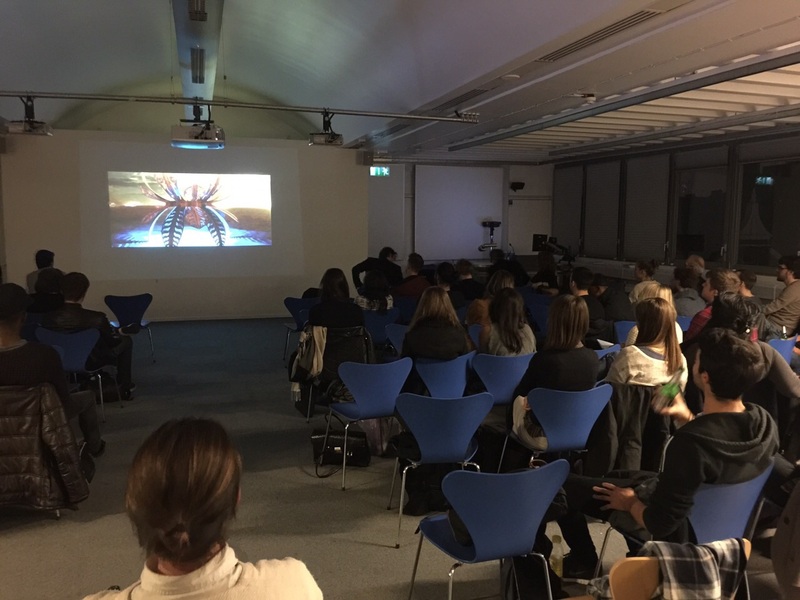 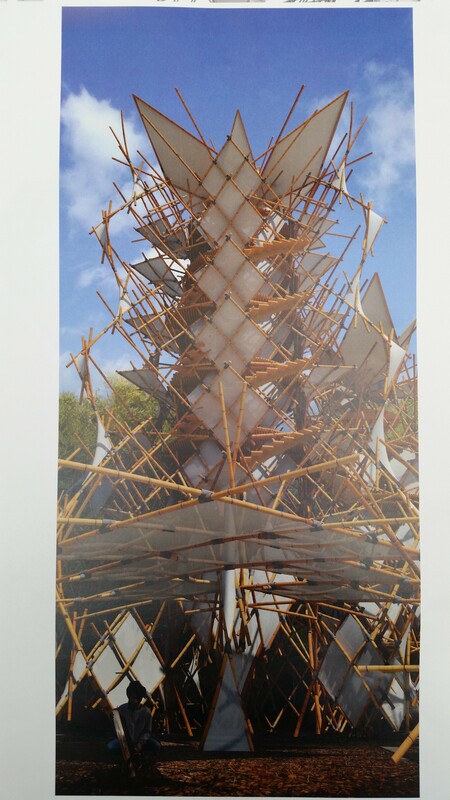 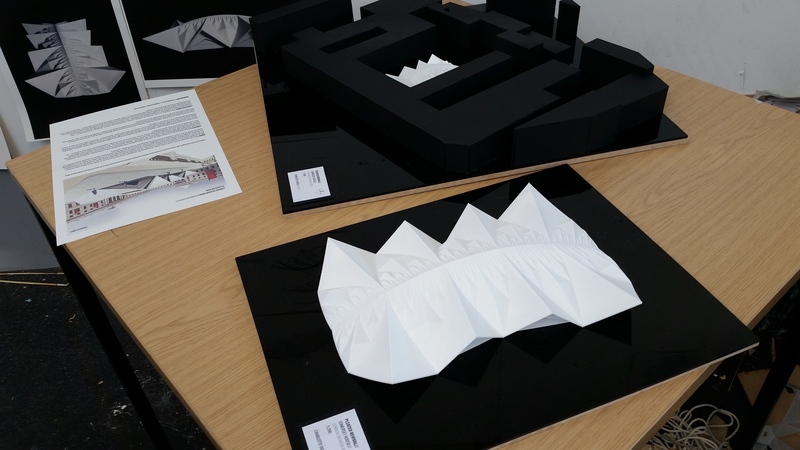 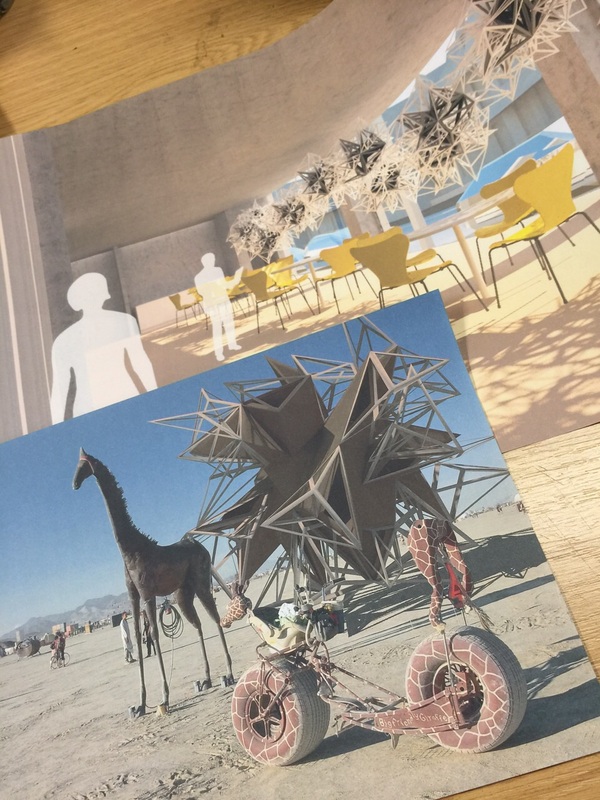 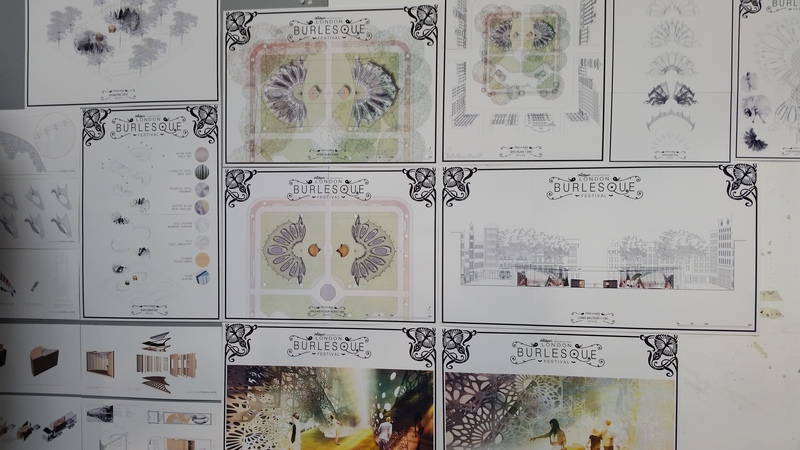 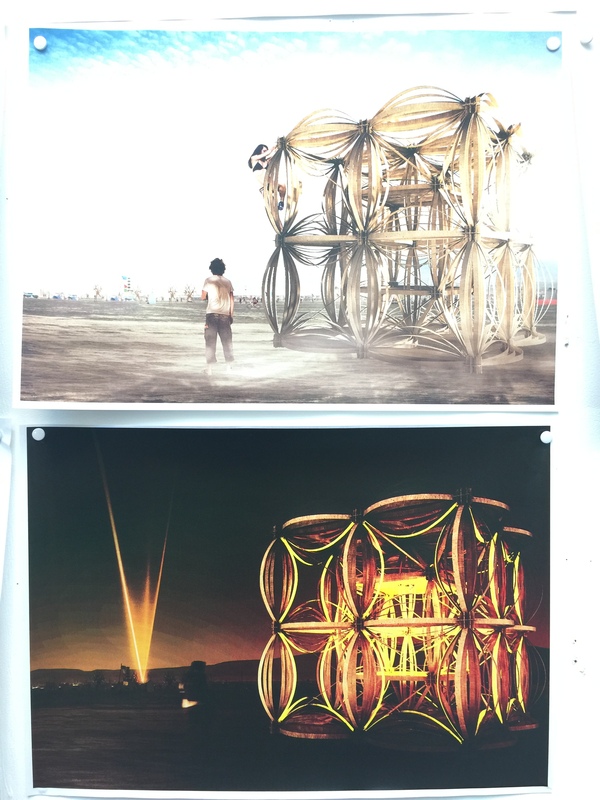 Some joyous proposals for both Burning Man and Buro Happold’s London office at yesterdays crit, the first of the year. 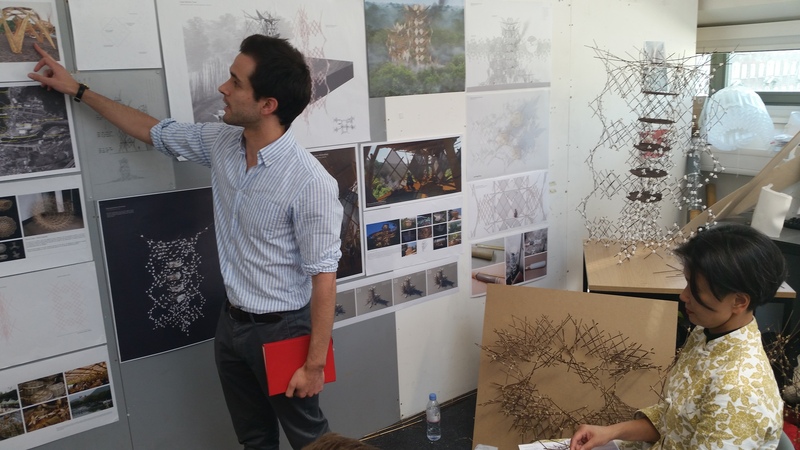 Our guest critics were Andrew Best, James Solly, Andrei Jipa, Harry Charringdon and Ben Stringer. 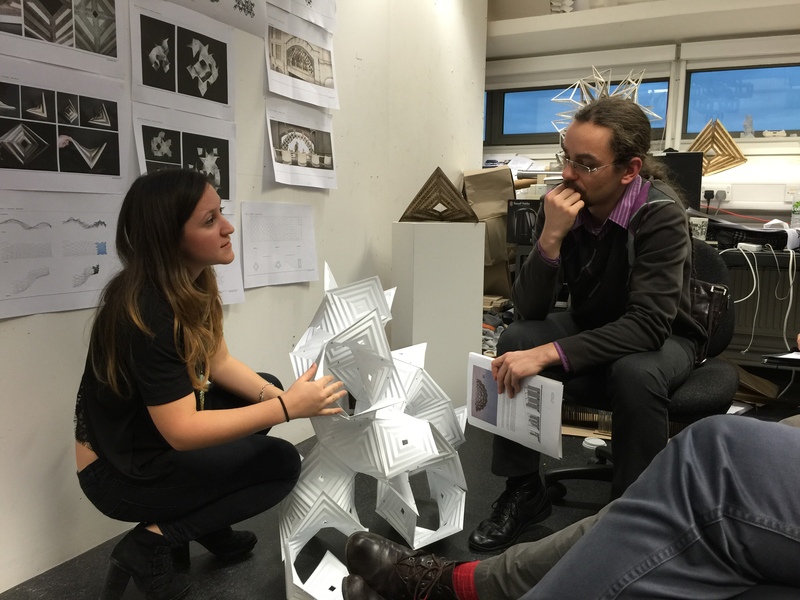 Thank you all for your inspiring comments and tireless enthusiasm throughout the day. 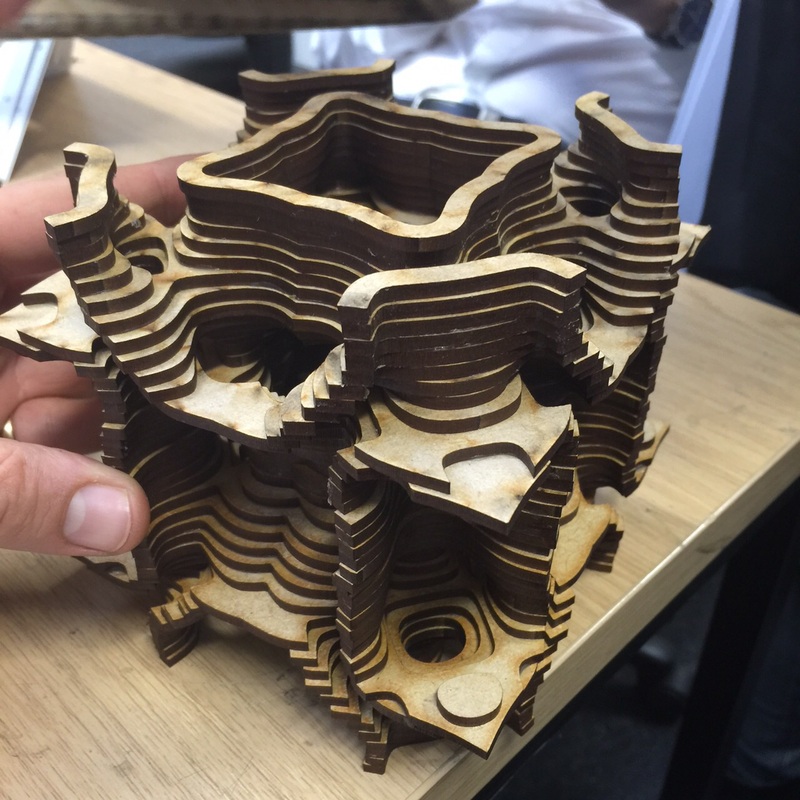 Tom Jelley’s Mirror deformation of 3d geometry using the inversion principle. 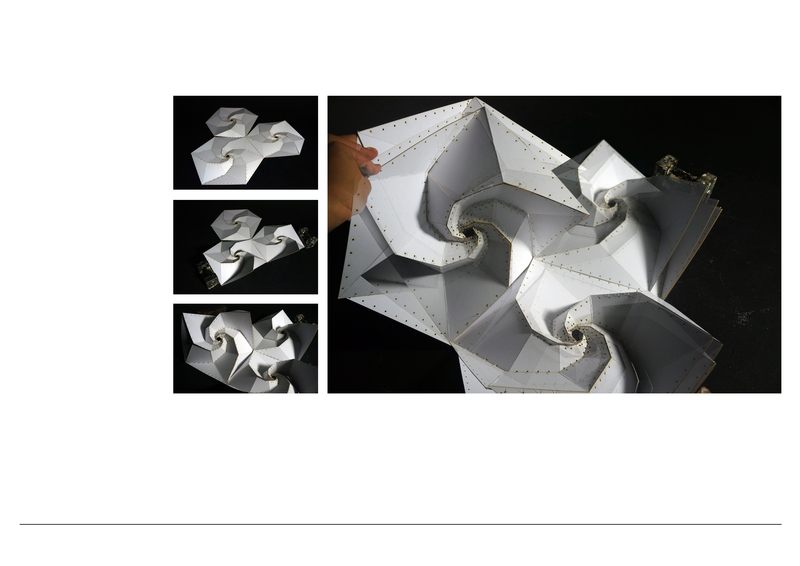 First developed in 1979 by Dániel Erdély the Spidron is created by recursively dividing a 2-dimensional hexagon into triangles, forming a pattern that consists of one equilateral followed by one isosceles triangle. 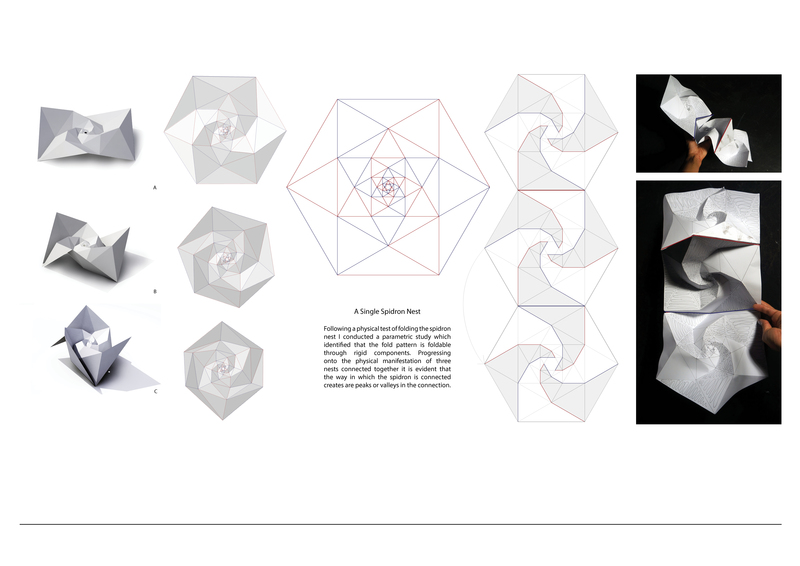 The resulting form is of six Spidron legs that, when folded along their edges, deform to create a 3-dimensional Spidron. 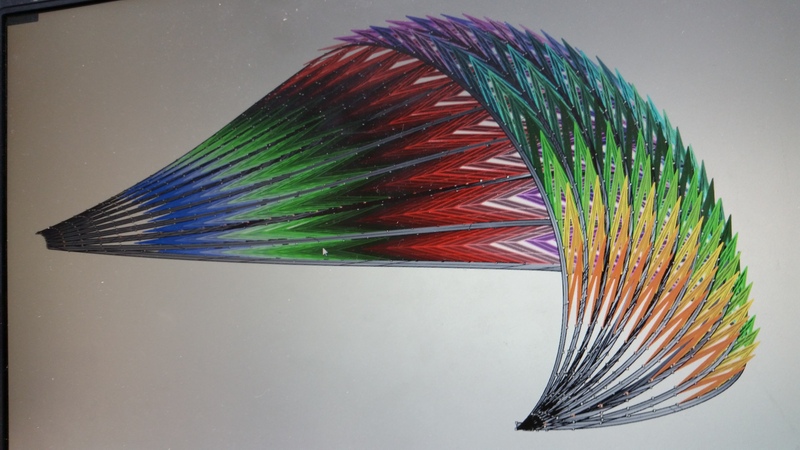 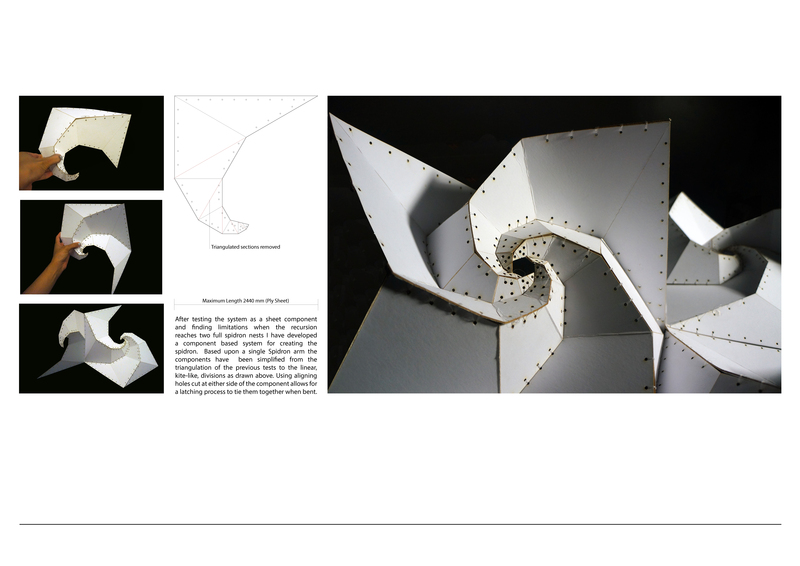 Initial investigations into the Spidron system using paper resulted in irregular shapes that could not be predicted, and therefore replicated precisely. 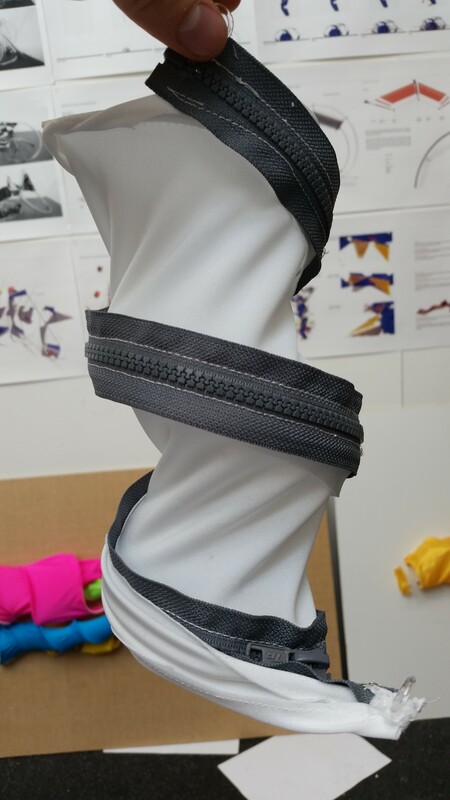 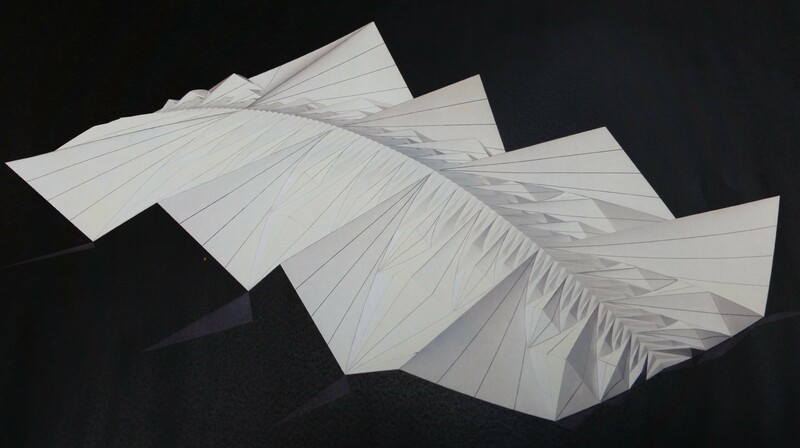 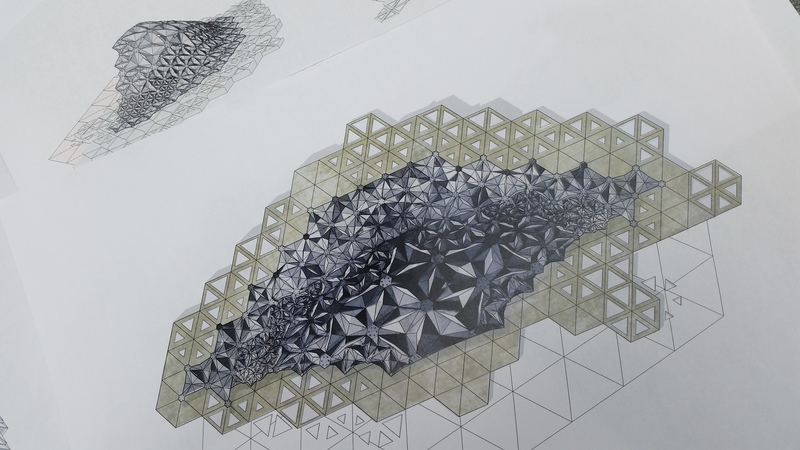 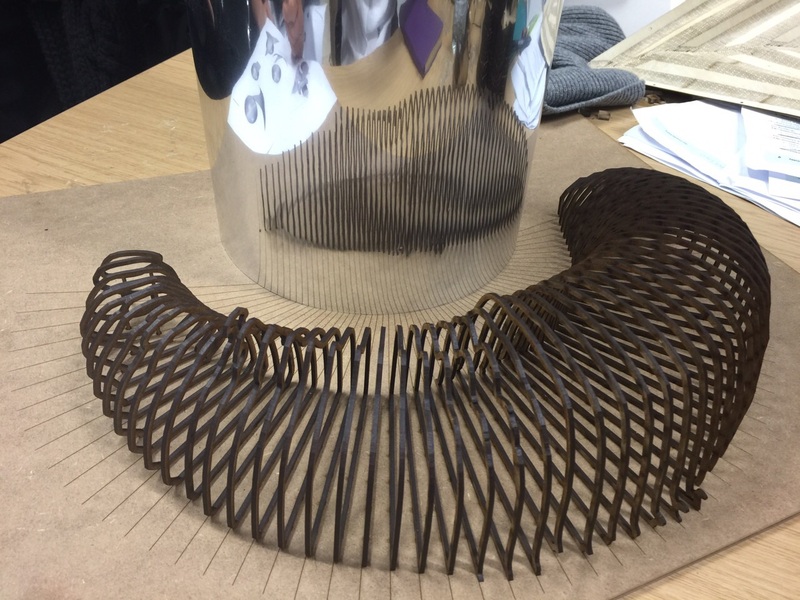 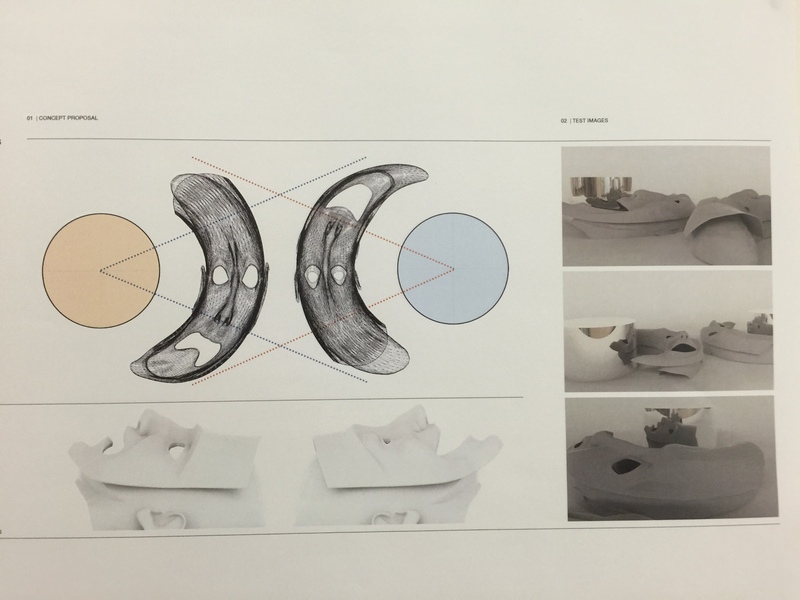 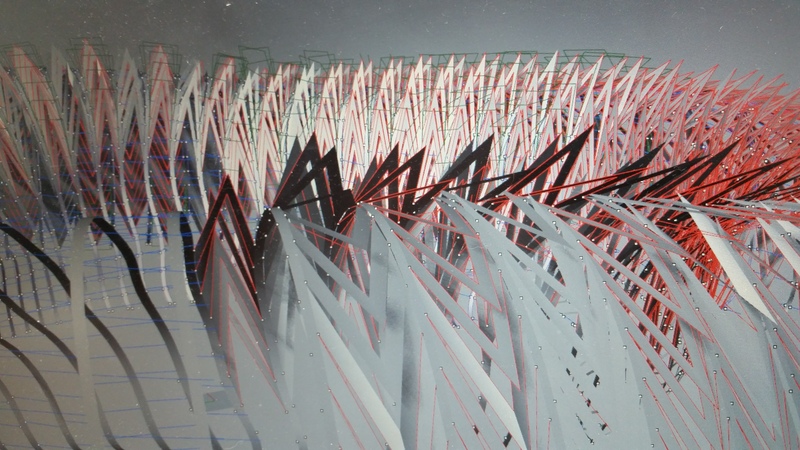 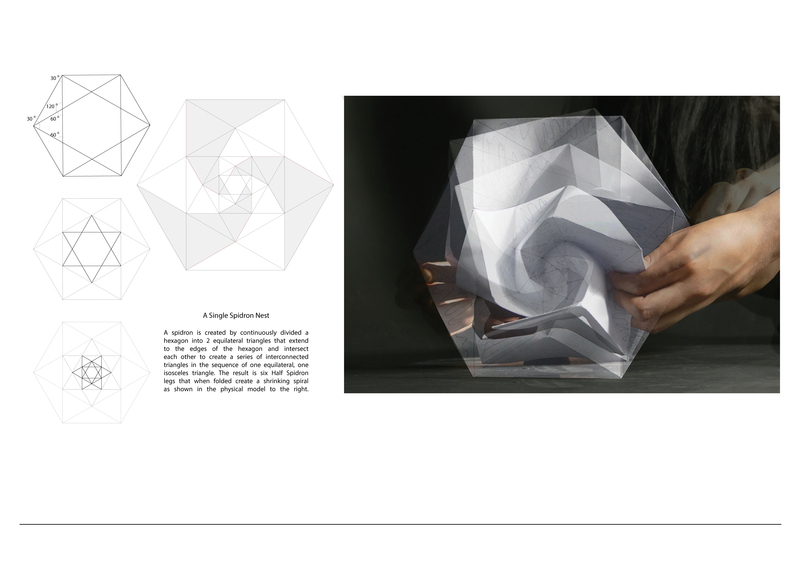 Progressing onto using rigid materials allowed the system to be broken down into six components, removing unnecessary triangulated fold lines, and developing latch folded Spidron that is precisely the same as that formed parametrically. 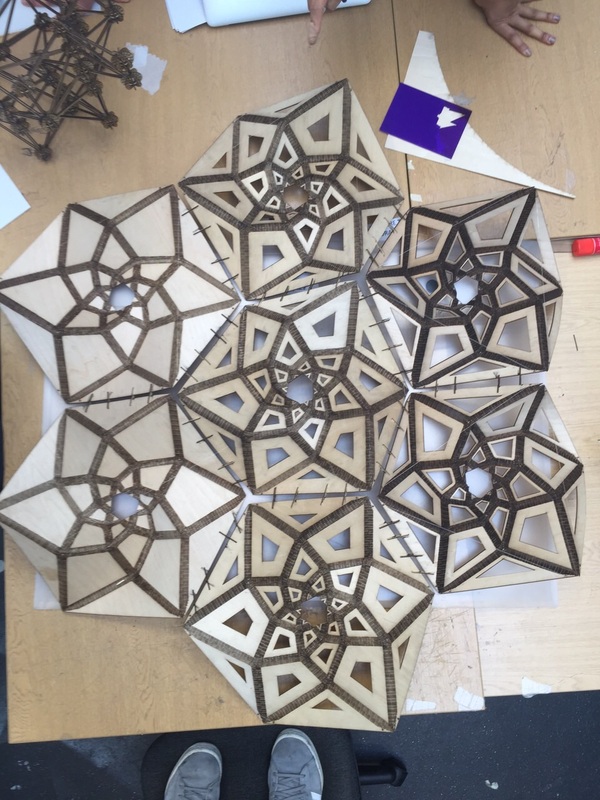 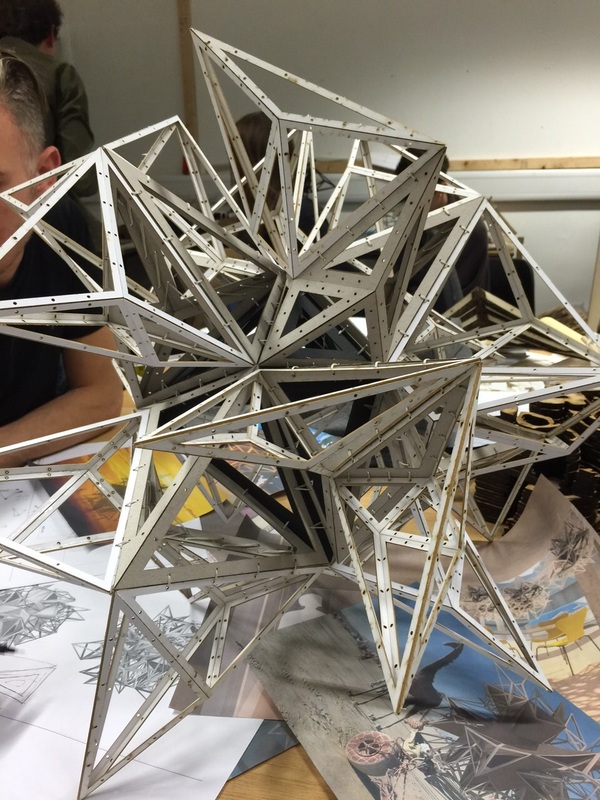 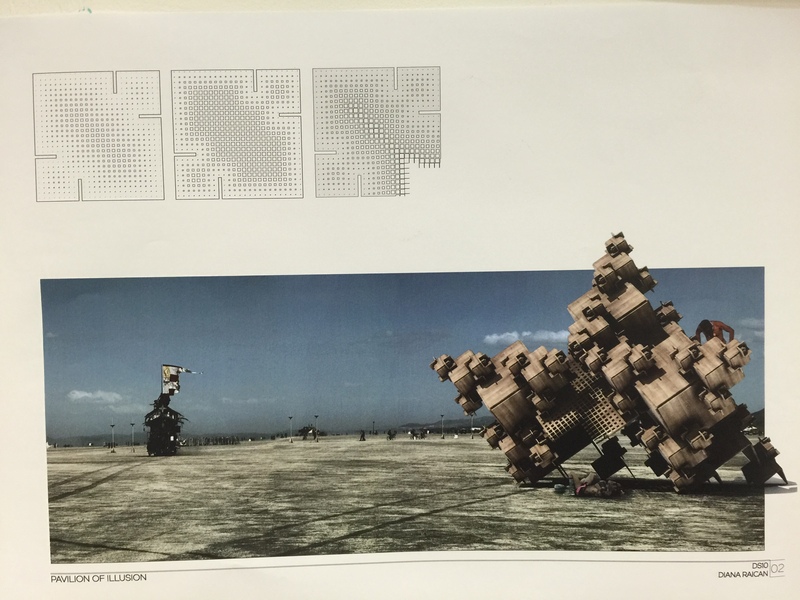 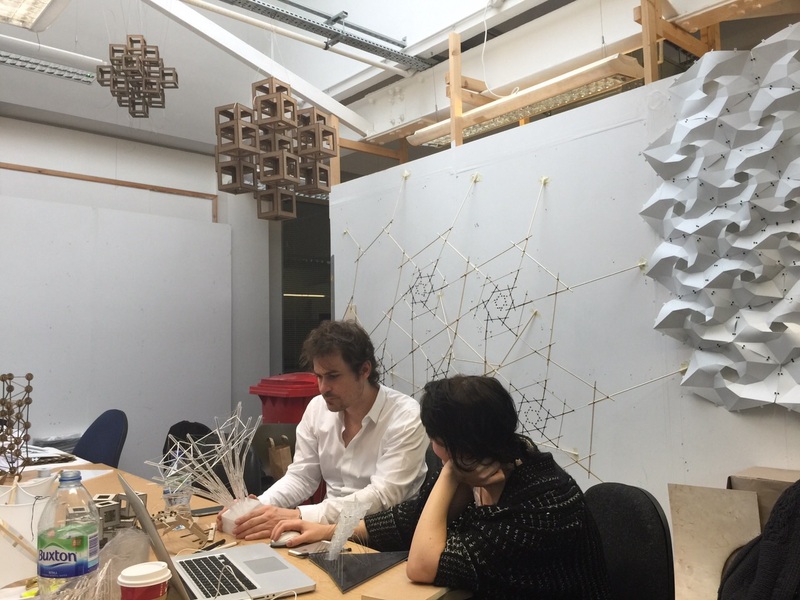 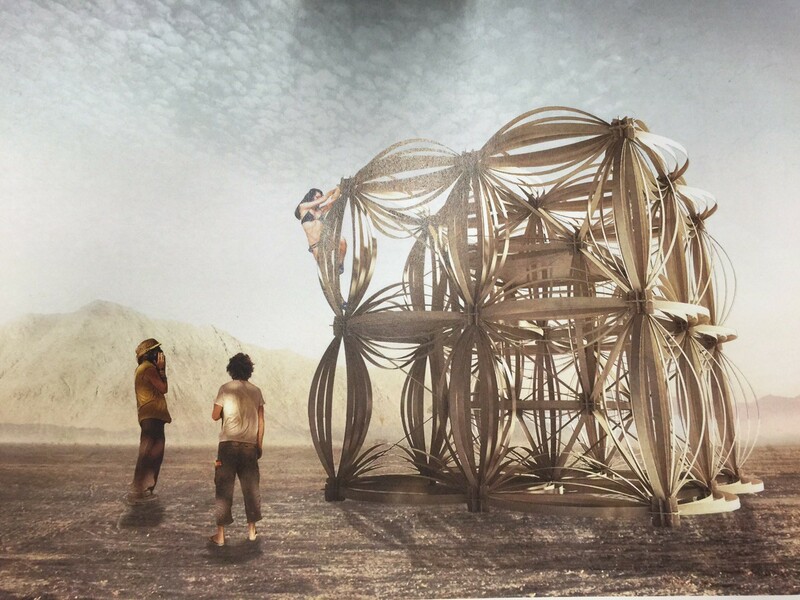 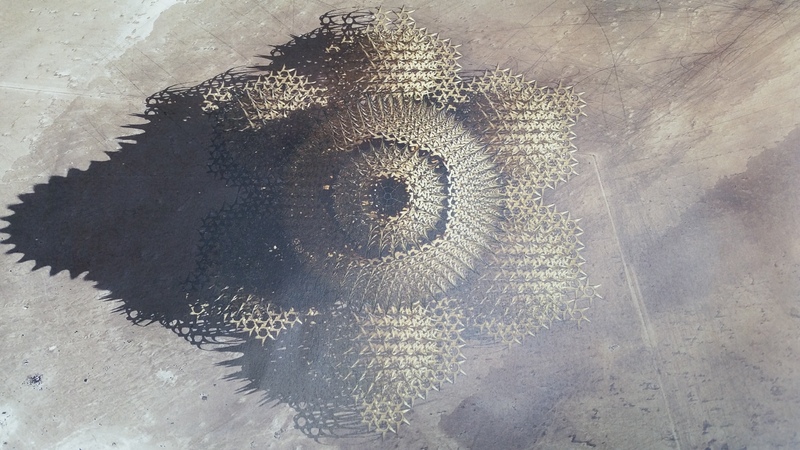 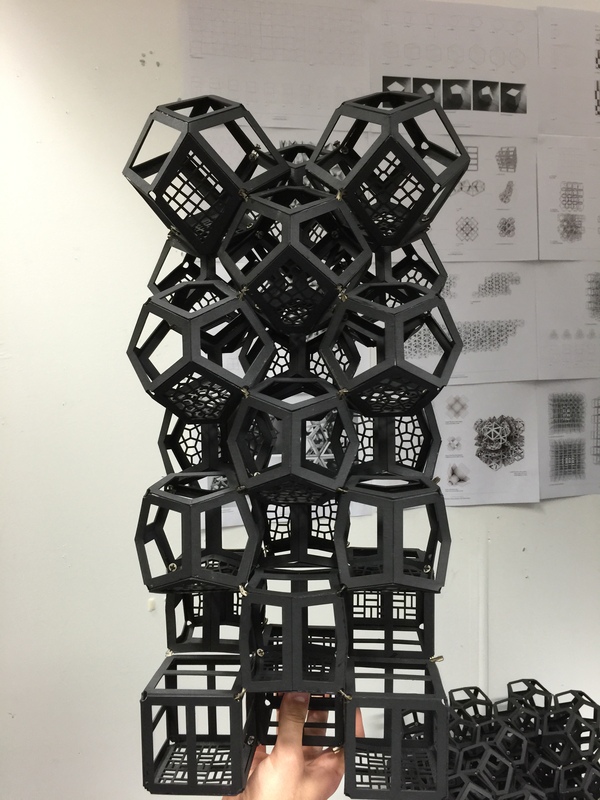 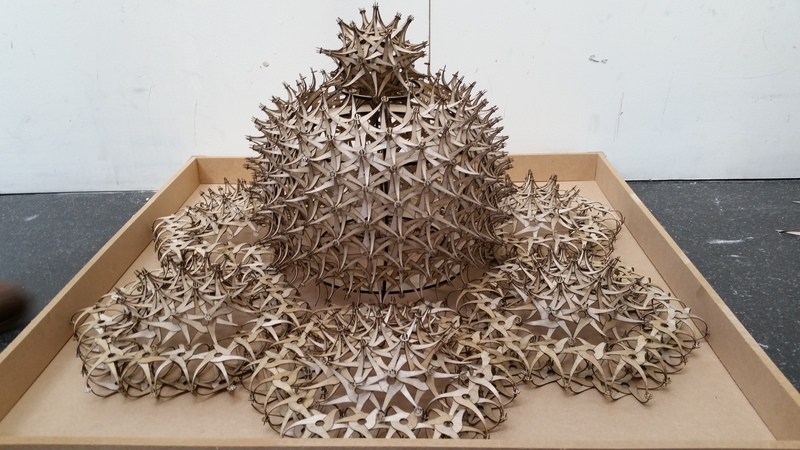 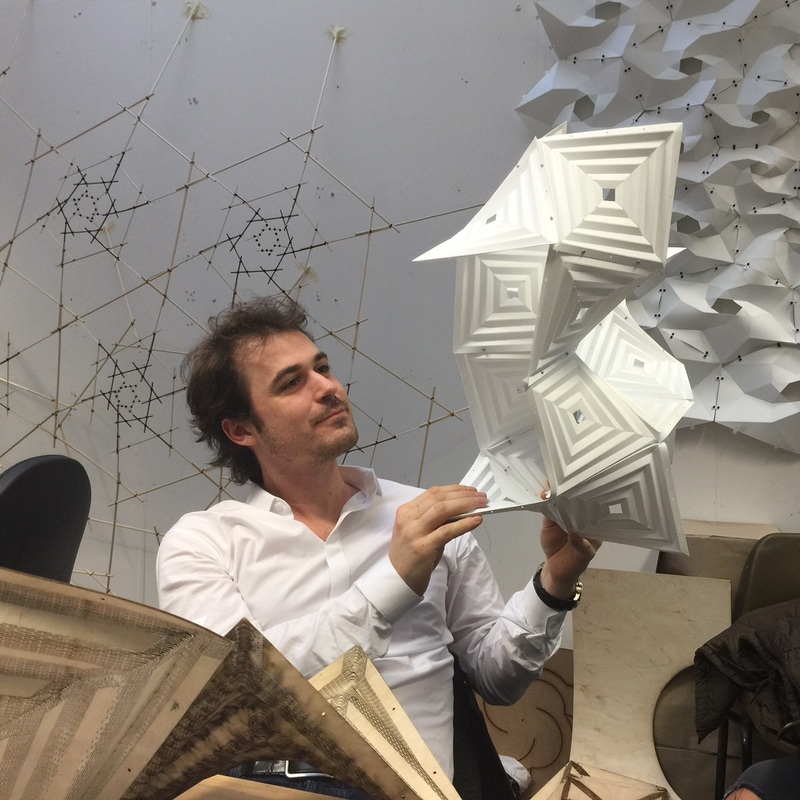 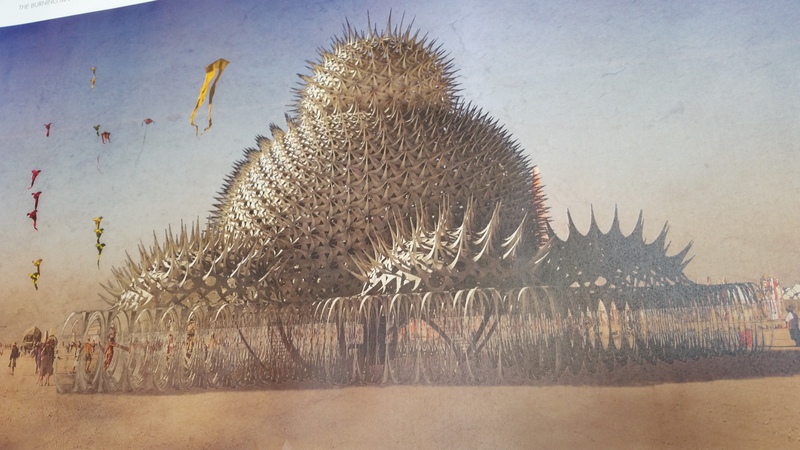 This relationship between parametric and physical tests of component based Spidrons in both regular and irregular hexagons, as well as various other equal-sided shapes, has enabled the development of large scale models concluding thus far in a 1:2 scale version being built which will continue to be developed as a pavilion for submission to the Burning Man festival. 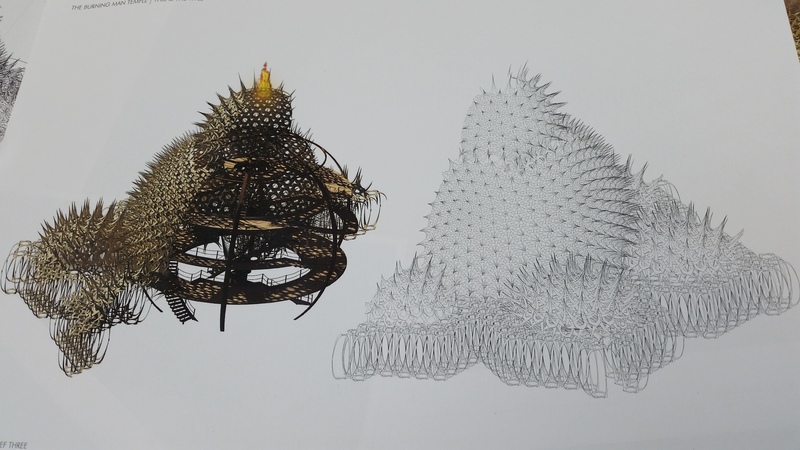 In parallel there has been an investigation into the system at a smaller scale allowing for the Spidron nest to be made as one component. 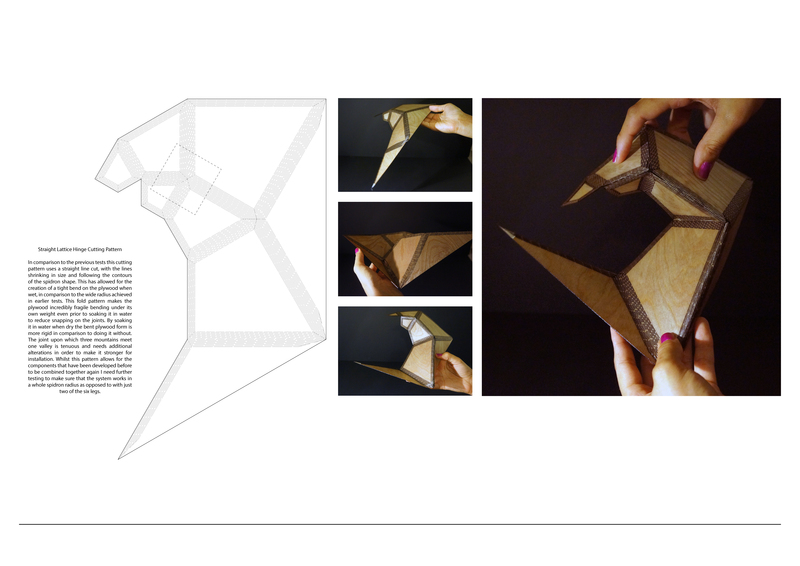 In order to achieve the 3-dimensional Spidron form lattice hinges, also known as kerf folds, have been employed. 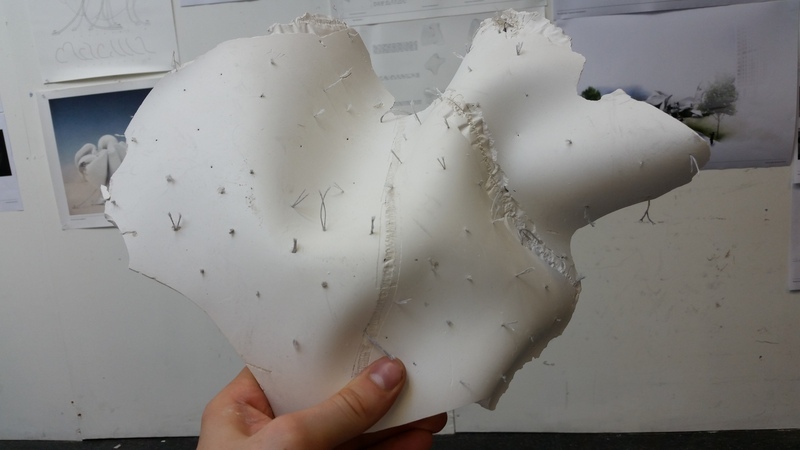 Rigorous testing into the best cutting pattern have resulted in a straight line cutting pattern that allows for bending on multiple axis at once. 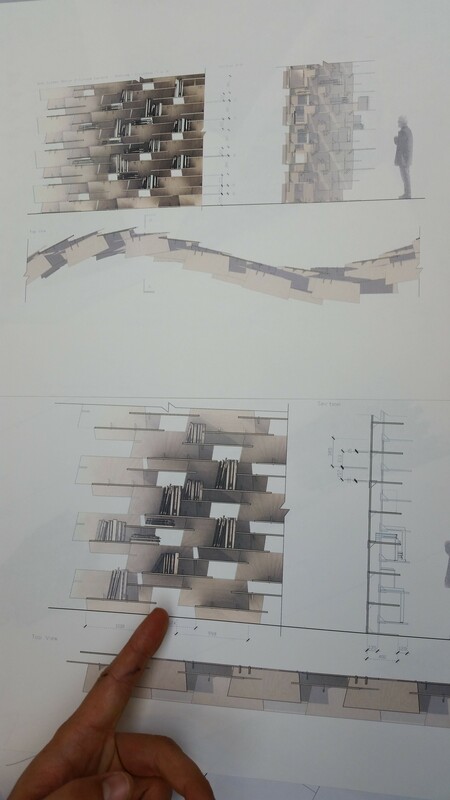 Developing this smaller scale system for submission to Buro Happold the intention is to create an arrayed system that is a conglomeration of both regular and irregular spidrons with varying depths and apertures that are able to integrate various display models etc. 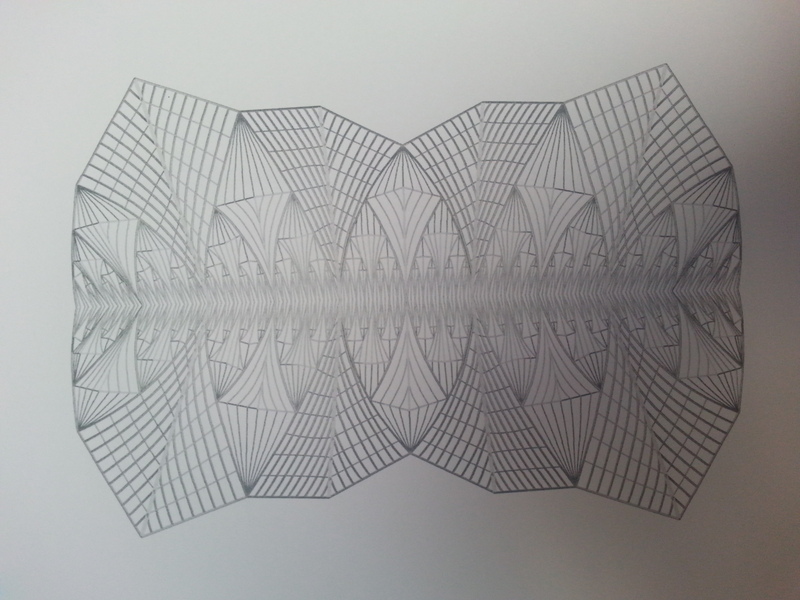 within. 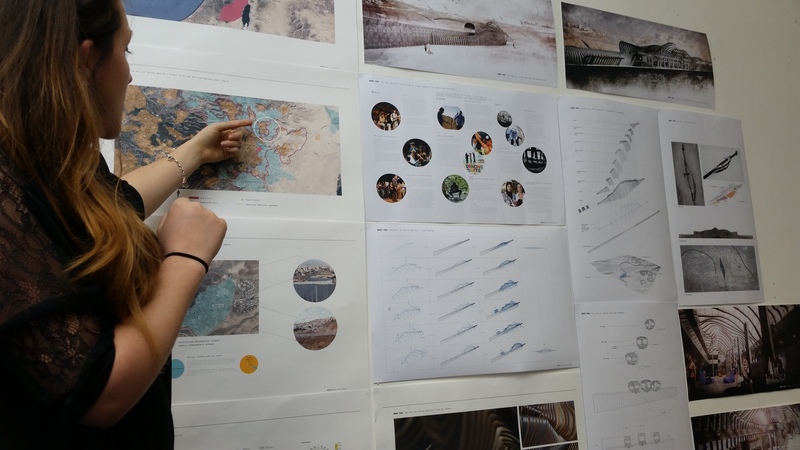 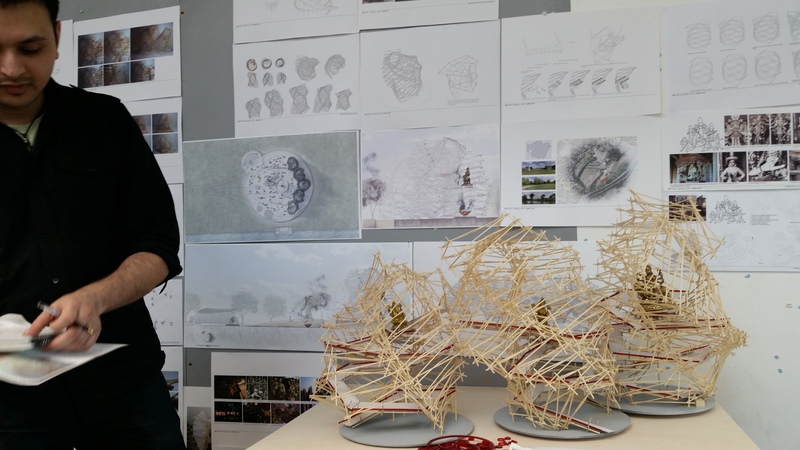 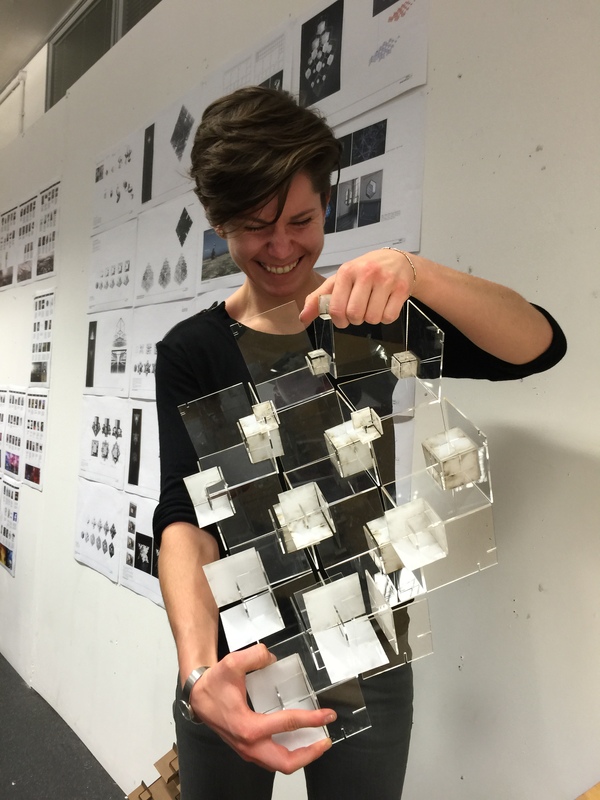 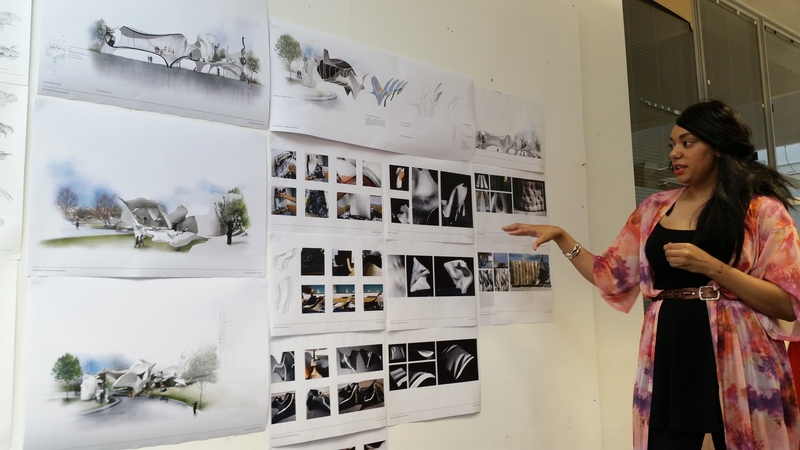 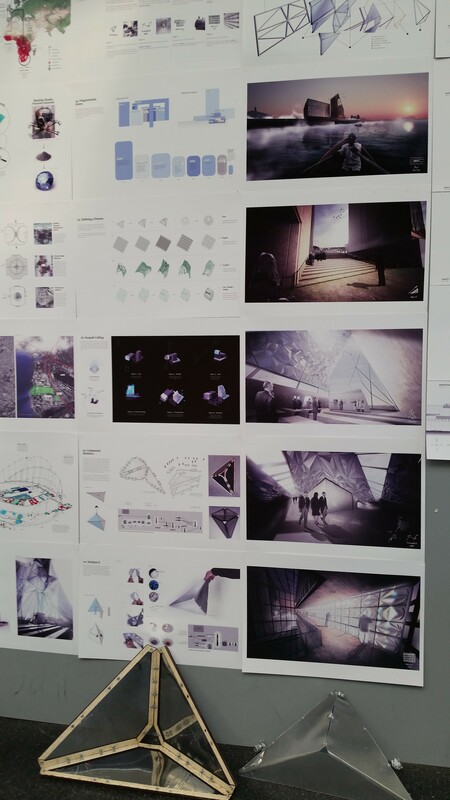 We had our final crit today! 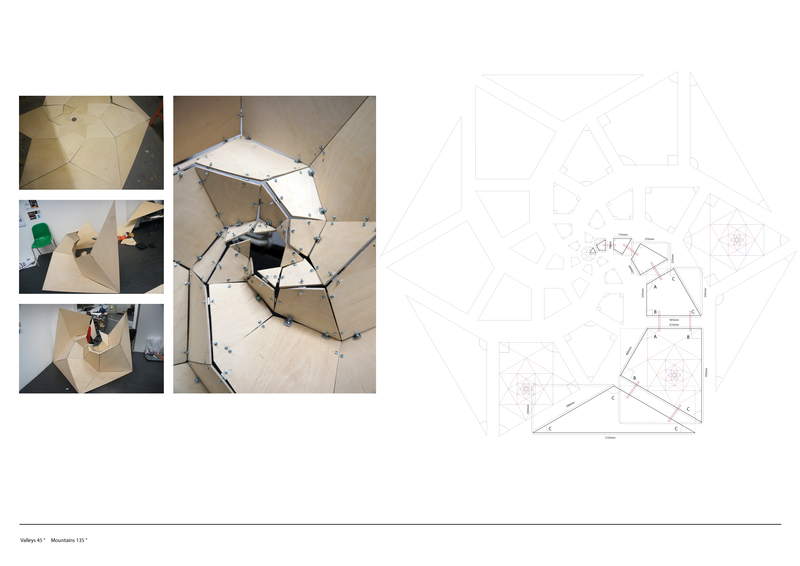 Great projects concluding our brief2B:Realize. 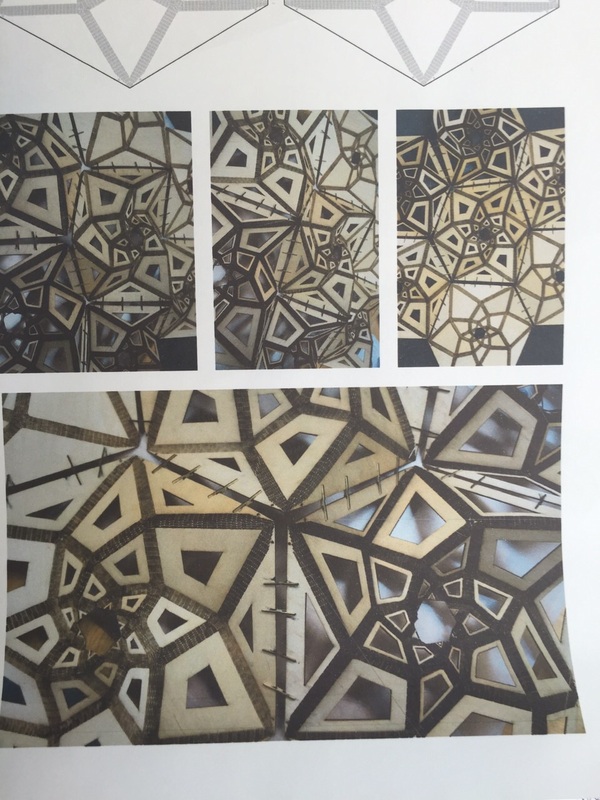 Here are couple pictures. 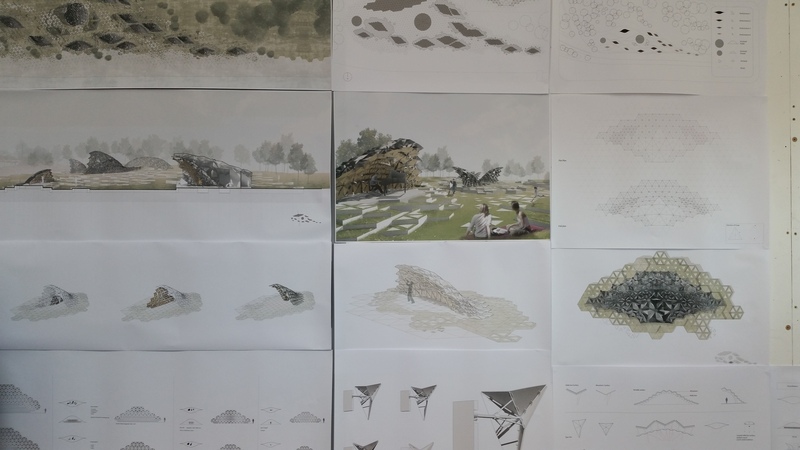 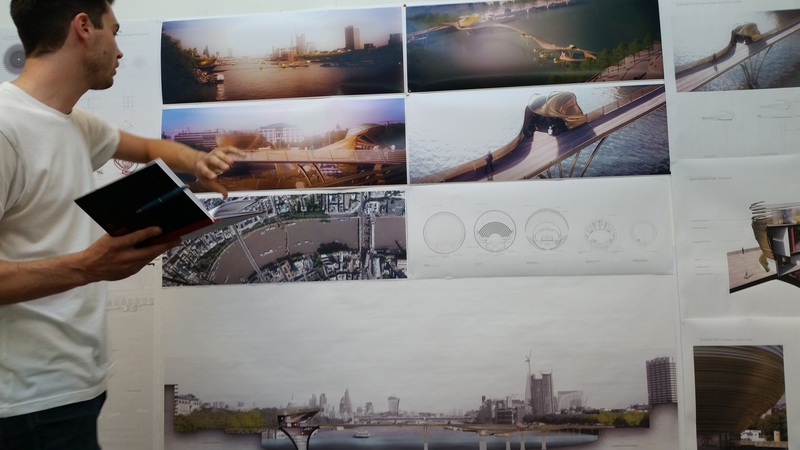 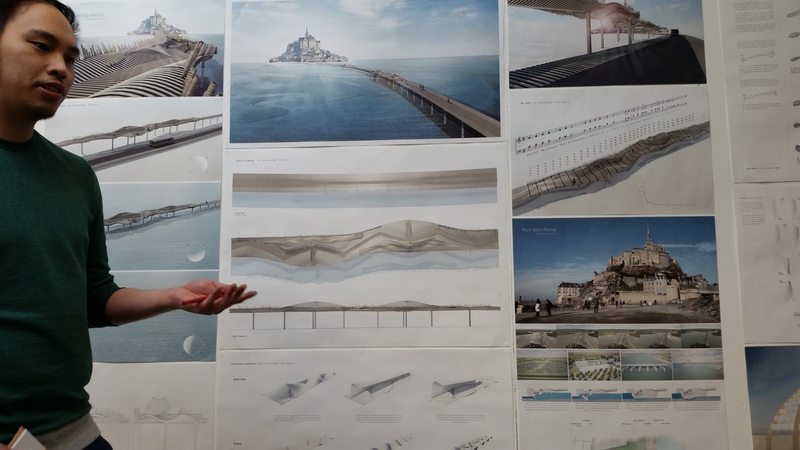 Thank you very much to our external critiques Daewha Kang (Associate Zaha Hadid Architects), Lawrence Friesen (GenGeo), Stephen Melville (Director Ramboll UK), James Solly (Buro Happold), Michael Clarke and to our colleagues Anna Liu and Roberto Botazzi. 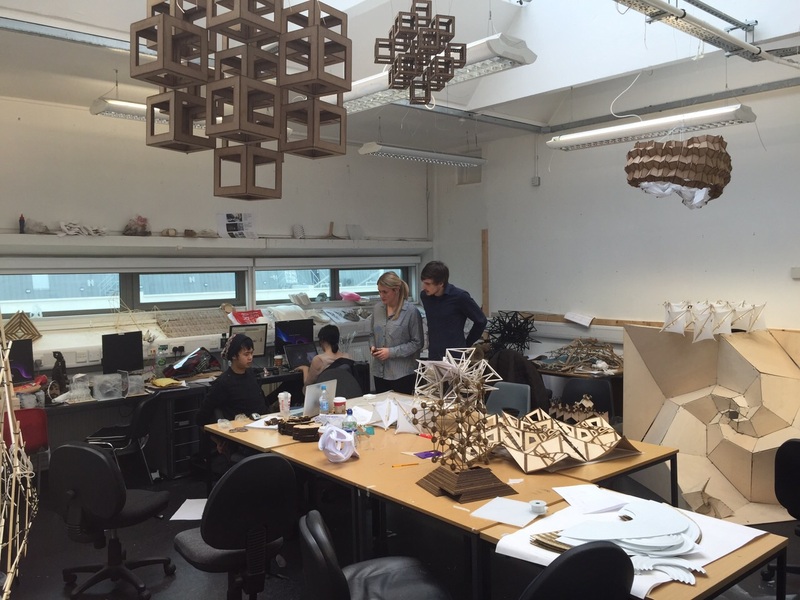 Our studio is back after a month of holidays. 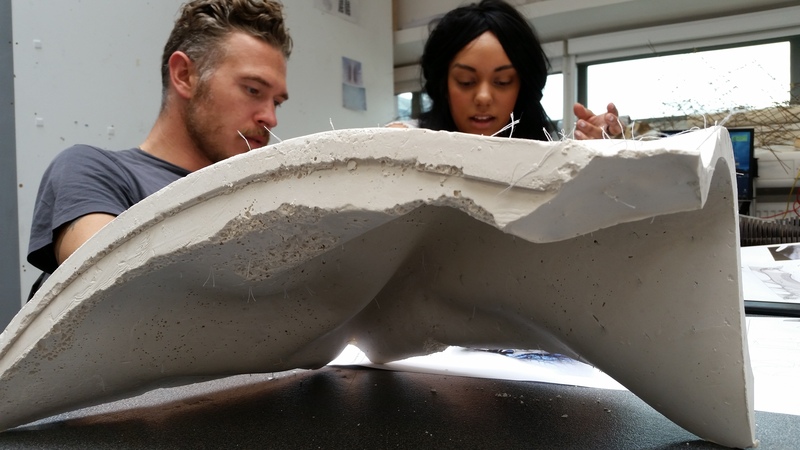 Here are couple pictures from our tutorials today. 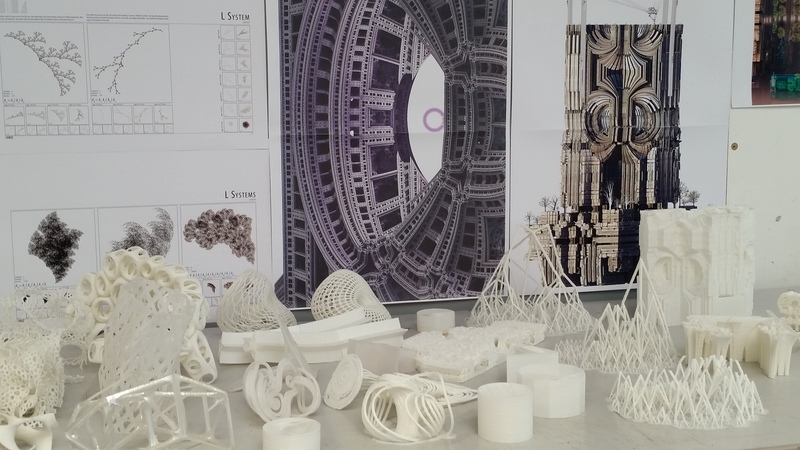 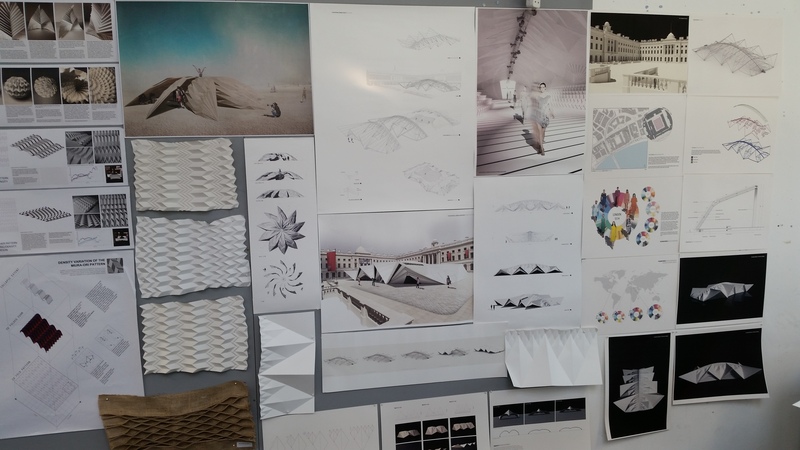 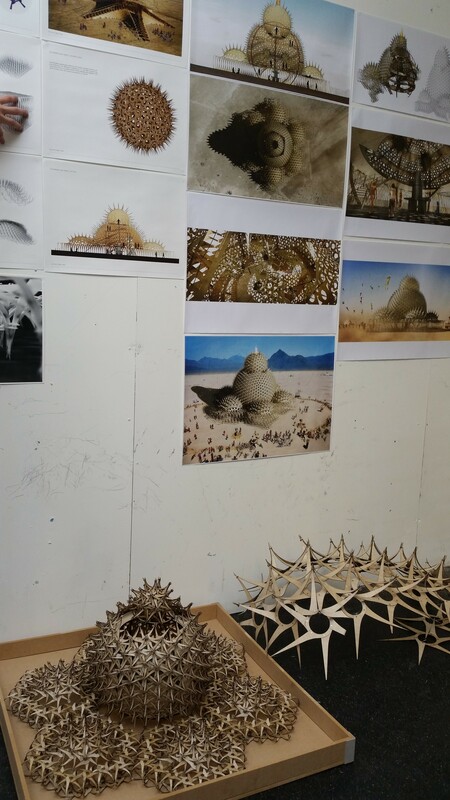 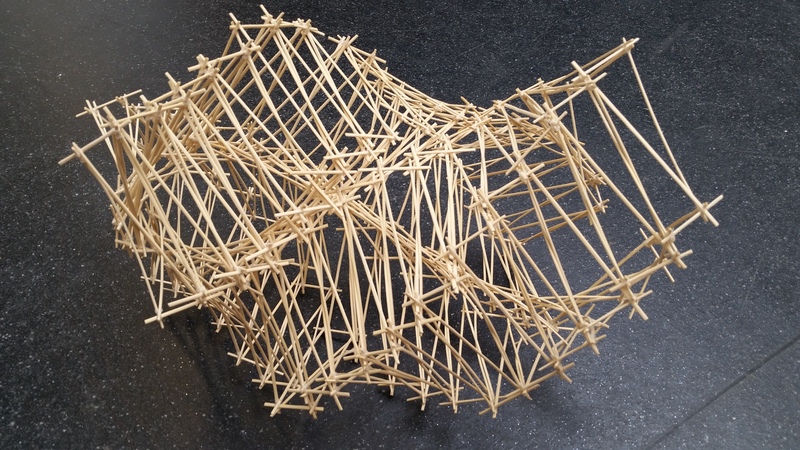 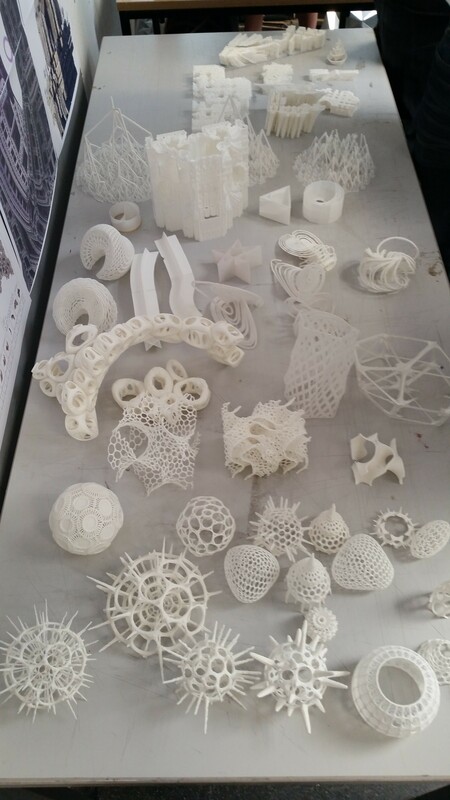 Impressive progress from our students including a 3D printed potato-based fractal civilization (Andrei Jipa), a series of recursive bamboo structures for the Durga Puja festival (Dhiren Patel), an origami roof for the fashion week (Charlotte Yates), a spiky eco-retreat to meet the Sami people (Natasha Coutts), a temple for the Burning Man festival made of reciprocal plywood components (Joe Leach), a hypar tower for the Damyang Bamboo festival (William Garforth-Bless), a Pop-Up book drop pavilion (Ieva Ciocyte), a surreal Dali Museum in the Park (Lorna Jackson), a promenade concert in Hyde Park (Sarah Shuttleworth) and many more… We are so excited by the diversity of projects this year and the clear continuity between our brief2A and brief2B. 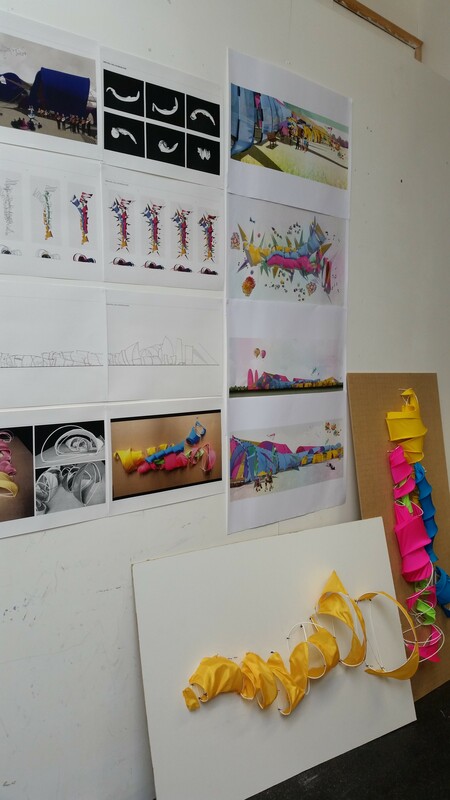 Looking forward to the final crit on Thursday 15th May! 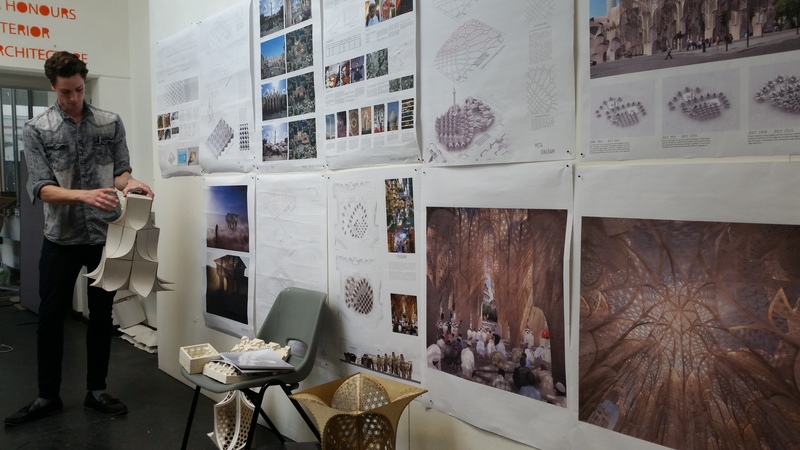 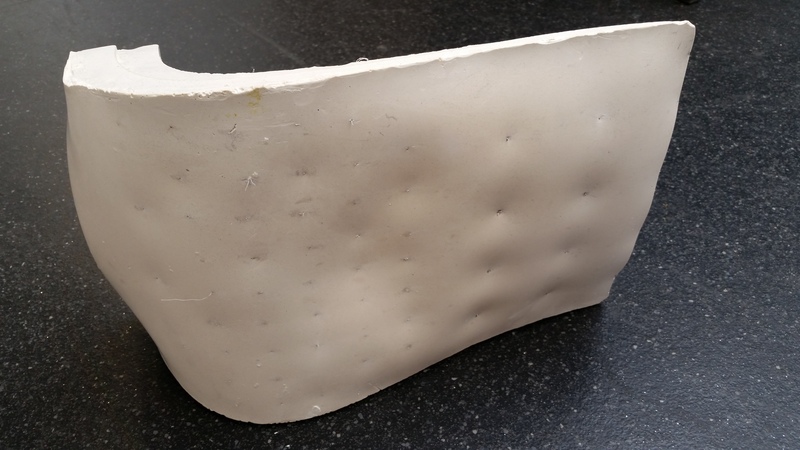 Current fourth year student, Paul Thorpe, has set up his own blog/website designed not only to display past and current projects but also areas of extracurricular activities and interests.